Limited edition: 1000 pieces. Exterior color is Deep Black, interior: beige. Panoramic roof! A ton of detail for such a small scale model. Nice paint finish. Wheels spin. VOLKSWAGEN T1b Bulli Renntransporter " Continental Motors", red/black, L.E. 500 pcs., 1:43 scale (approx. You want to own this model set, as it represents a nice replica of the VW T1b Bulli Renntransporter "Continental Motors", and you can park it on your desk or shelve. ). 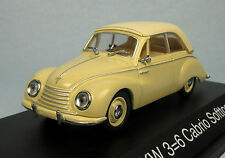 SCHUCO DKW 3=6 Cabrio Softtop (Cream) 1/43 Scale Diecast Model NEW, RARE! SCHUCO DKW 3=6 Cabrio Softtop Convertible (Cream) Top Up 1/43 Scale Diecast Model NEW, RARE! Rare, Limited Edition of the famous 2-Stroke Engine DKW 3=6! See also my other DKW 3=6 Hardtop in Red paint finish on sale! SCHUCO Opel Vectra Sedan (Black) 1/43 Scale Diecast Model NEW, RARE! Nice! SCHUCO Opel Vectra 4-Door Sedan (Black) 1/43 Scale Model NEW, ULTRA-RARE! Opel dealer promotional. Rare, Limited Edition. 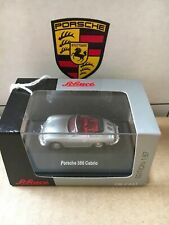 Highly collectible precision diecast scale model released by Schuco (Germany). Schuco Porsche 356 B/C Cabrio. Condition is New. Shipped with USPS 1st class. It’s a Schuco, what else do you need to say. This has been in my collection for a long time. SCHUCO Audi A5 Coupe 3.2 (Garnet Pearl) 1/43 Scale Diecast Model NEW, RARE! SCHUCO Audi A5 Coupe 3.2 Quattro (Garnet Pearl) 1/43 Scale Diecast Model NEW, ULTRA-RARE! Ultra-rare, Limited Edition: 1 of only 1,500 pieces! Highly collectible precision diecast scale model released by Dickie-Schuco (Germany). SCHUCO Audi Q7 (Mugello Dark Blue) 1/43 Scale Diecast Model NEW, RARE! Neat SUV! SCHUCO Audi Q7 (Mugello Dark Blue) 1/43 Scale Diecast Model NEW, ULTRA-RARE! Ultra-rare, Limited Edition: 1 of only 1,500 pieces! Highly collectible precision diecast scale model released by Dickie-Schuco (Germany). Schuco Modell Porsche 911 S . Condition is New. Shipped with USPS First Class Postage. This model goes back to the 1970’s. It’s a beautiful Porsche 911 S. The doors open to show the detail of the interior. On the bottom of the car they give some of the cars specs. The car number for racing is 5. Great item for anyone’s collection. MANUFACTURER: Schuco Limited Edition. 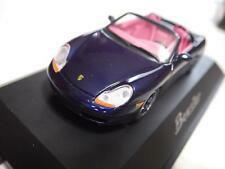 MODEL: Porsche Boxster. COUNTRY: Germany. COLLECTOR'S REMARKS: Limited edition #797 of 1000/(Model Fahrzeug) on Plynth/very difficult to find. YEAR ADDED TO COLLECTION: 2001. The Porsche 911 GT3 RS beautifully detailed in a Edition 1:87 scale. Perfect for any collection. The Boxster S in red is one of the Porsche cars I have had. Although my interior was beige. 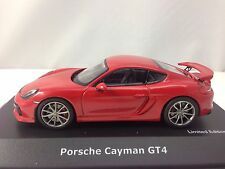 If your collecting Porsche models, this is a nice one to have. Get one in each color and each size. SCHUCO Mercedes-Benz E Klasse T-Modell (Black) 1/87 HO Scale Diecast Model NEW! KG (Germany). Sold "as is". Precision Scale Model. The item is mint new and has never been removed from its showcase. Schuco Porsche 356 A Coupe. Condition is New. Shipped with USPS 1st class. This model has been in my collection for many years. It is nicely detailed from Schuco. SCHUCO Opel Vectra Caravan (Dark Green Met.) 1/43 Scale Diecast Model NEW, RARE! Opel dealer promotional. Rare, Limited Edition. Highly collectible precision diecast scale model released by Schuco (Germany). This is a rare Opel dealer promotional for General Motors (GM) Opel dealers in Germany, UK and Spain. MANUFACTURER: Schuco Limited Edition. MODEL: Volkswagen New Beetle. MATERIAL: Diecast. COUNTRY: Germany. COLLECTOR'S REMARKS: Limited edition of 1000 pieces/Lovely model. YEAR ADDED TO COLLECTION: 2004. SCHUCO 1972-7 Opel Commodore GS (Green) Coupe 1/43 Scale Diecast Model NEW RARE! Rare, Limited Promotional Edition. Highly collectible precision diecast scale model released by Schuco (Germany). Amazing detail! Includes small booklet with Opel engine specs. Mounted on a silver plastic plinth stand. SCHUCO Alfa Romeo 156 GTA (Red) 1/87 HO Scale Diecast Model NEW! Schuco Junior Series Porsche Carrera GT. A nicely detailed model for any collection. SCHUCO Volkswagen T3 Kasten Van Dunlop (Yellow) 1/87 HO Scale Diecast Model NEW! Volkswagen T3 Kasten Van Dunlop (Yellow/White). 1/87 HO Scale Diecast Model NEW! KG (Germany). Sold "as is". Precision Scale Model. Edition 1:87 Series. The item is mint new and has never been removed from its showcase. A beautiful Porsche 356 in a factory sealed box. Never opened. What more can I say! The legendary 550 Porsche. One of my favorite cars. You must have as many sizes, colors as possible in your collection. I demand it. Ha ha. Unfortunately I don’t have the hold down cam screw to hold the car in place on the mount . MANUFACTURER: Schuco Limited Edition. MODEL: Porsche Carrera Coupe. MATERIAL: Diecast. COUNTRY: China. COLOR: Yellow. COLLECTOR'S REMARKS: Limited edition/lovely model. YEAR ADDED TO COLLECTION: 2004. MANUFACTURER: Schuco. MODEL: BMW 335 Sedan. MATERIAL: Diecast. SCALE: 1:43. COUNTRY: China. ITEM NUMBER: 007127_023095. YEAR ADDED TO COLLECTION: 1999. MANUFACTURER: Schuco Limited Edition. MODEL: Porsche 911 Carrera Coupe. MATERIAL: Diecast. COUNTRY: China. COLOR: Yellow. YEAR ADDED TO COLLECTION: 1999. MANUFACTURER #: 04344. Schuco Limited Edition (China) Yellow Porsche 911 Carrera Coupe Diecast 1:43 NIB. MANUFACTURER: Schuco Limited Edition .